Three distinct features set Procol apart. Our people are a professional team of experienced and innovative problem solvers. We’ve a proven approach that delivers your working environment smoothly and safely together with less waste and lower costs – plus we provide proactive, long-term support throughout its life cycle. Procol was founded in 1995, and the key members of our Senior Management team have over 100 years’ experience between them. Our team includes engineers, interior designers, planners, M&E engineers, project managers, admin staff and specialist tradespeople, all of whom work together on many projects. Over the last 20 years, we’ve worked on a diverse array of projects for an impressive selection of clients, including those in the scrolling list below. Our clients value not only our creative and problem-solving skills, but also our ability to spot and prevent potential issues before they occur. Additionally, clients cite our focus on clear communication and managing safe, efficient sites as making a positive difference to them and their project. 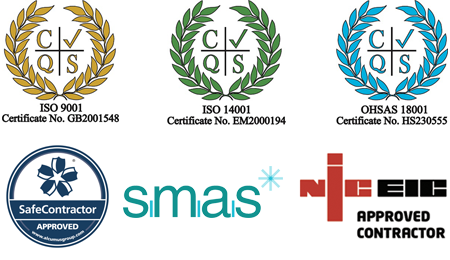 As evidence of these attributes, we are ISO 9001, ISO 14001 and OHAS 18001 accredited. We have Safecontractor Approved and NICEIC Approved Contractor status. We are also SMAS assessed and REFCOM F-Gas certified. We don’t see project delivery as the end of the road, just a significant point in the working-environment life cycle. Post-delivery, we provide proactive advice and insight to keep you aware of new ideas, opportunities and technologies that could benefit your business, and to help you plan future investment. 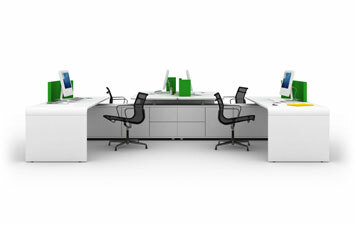 What’s more, should your office space need additional chairs, desks or furnishings of any kind, we’ll be happy to source them for you. To get a feel for the breadth of our work, view our recent projects. Alternatively, to learn more about any aspect of our business, or to discuss your office environment or technical environment project, simply get in touch.